The White Card with the Picture on it is a proximity card. It has been printed on the front so that it is a Corporate Photo ID. It has a magnetic swipe on the rear and has been back printed with a return address in case it is lost. This sort of token is merely presented near the reader for it to transfer its information to the access control system it may also be used in other systems as it may be read in a magnetic swipe reader. A cardholder may also keep this sort of card in their wallet or purse and just present the wallet to the reader and if it is valid it will let you in. 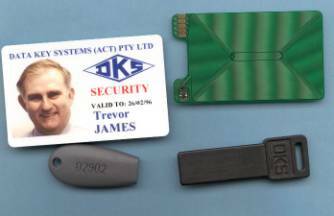 The Bottom Left Object is a proximity Fob that can be attached to a key ring and like the card it is put near the reader to gain entry though an access control point. While a card can be lost quite easily or be placed in a different pocket , people rarely lose their car keys. The Black key on the bottom right hand side is a DKS Data Key. It is an entirely Australian invention and works via inserting into a reader and then withdrawing it again (at any speed). This key is a rare earth magnetically encoded key. There are many different technologies and methods used in access control. It should be remembered that data can flow in both directions when a smart key is presented to a reader. A photograph of the cardholder can be placed on the token and read off to verify that it is the correct person using the card. Likewise prepaid monetary credits can be deleted when accessing certain objects like car parks, photo copiers, printers or whatever. Many tokens now contain their own RAM, ROM and even realtime clocks.